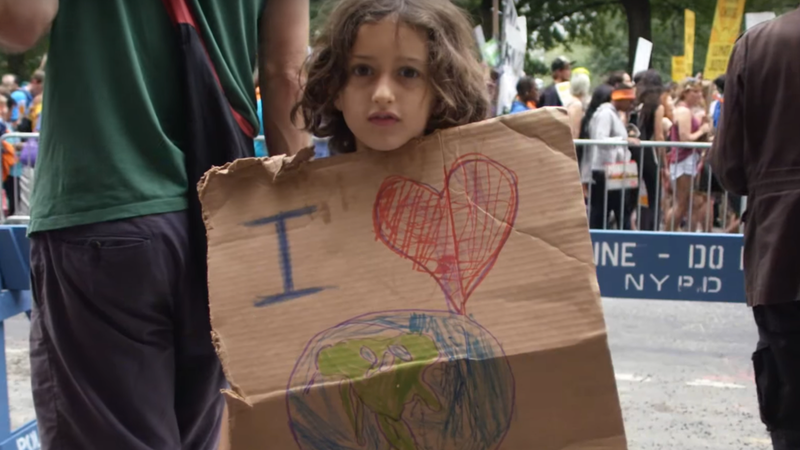 The Sierra Club just released an inspirational, stop-binge-watching-Netflix, get-off-the-couch-and-do-something climate change video in anticipation of the People's Climate March. Narrated by Chloe Sevigny and Joseph Gordon-Levitt, the video focuses on pretty much the most quintessentially American things out there: the Declaration of Independence, the Constitution, the Gettysburg Address, the Statue of Liberty, and The Oath of Office of the President of the United States. Entitled “We Hold These Truths”, and filled with patriotic language and symbols, the piece raises the question of why politics got involved in the climate discussion at all; shouldn’t Americans, patriotic or not, agree with the scientific consensus that burning of fossil fuels is causing global warming and leading to potentially catastrophic outcomes? Climate change wasn’t always as politically polarized as it is now. In 1970, under the Republican President Richard Nixon, the U.S. celebrated its first Earth Day, created both the Environmental Protection Agency and National Oceanic and Atmospheric Administration, and passed the Clean Air Act, which led to the first set of federal regulations restricting carbon dioxide emission levels. I would only hope…that all of us, Democrats, Republicans, the House, the Senate, the executive branch, that all of us can look back upon this year as that time when we began to make a movement toward a goal that we all want…we signed a historic piece of legislation that put us far down the road toward a goal that Theodore Roosevelt, 70 years ago, spoke eloquently about: a goal of clean air, clean water, and open spaces for the future generations of America. Nixon hadn’t run on an especially green platform, but he pursued environmental legislation because of mounting public and political pressure. Now those policies are under attack. So it's time to march again. The People’s Climate March is happening on April 29, marking President Trump’s 100th day in office. The march will take place in Washington and 85 sister cities. See sc.org/pcm to find a rally near you.